This chapter presents an innovative approach to the study of the journey to residential burglary. We demonstrate a simulation model that is built upon the integration of cellular automaton (CA) and multi-agent system (MAS). The model utilizes both social disorganization (SD) and routine activity (RA) theories to predict locations of residential burglary targets. The model simulates an offender as an intelligent agent of MAS that interacts with the target and place automata of CA. The likelihood of a residential burglary is modeled as a function of offender’s motivation, target desirability and place guardianship, which in turn are determined by the offender’s individual characteristics often used by RA and the target and place’s neighborhood properties frequently utilized in SD. The model was initialized and parameterized using “real” crime data from Dallas, Texas Police Department. 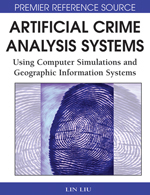 Results under two different weighting scenarios were obtained and compared with the actual distribution of offense locations, revealing the flexibility of model in its capability to assessing the influence of the two theories in burglary crime simulation. In closing we propose possible modifications that could be made to the model in the future.